Cost Depends on many factors Like Basic Color vs Woodgrain colors, Accessories,etc..However you will get the best quality around and the best price.We Design whatever you can Dream of and Build it for you. 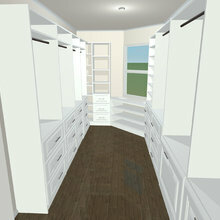 Professional Design&Installation of Custom Closets,Pantries,Garages and Laundry and much more. Carlos was an excellent hire. His professionalism exceeded my expectations. He was on time, artistic in his work, and above all extremely helpful and personable. I will definitely rehire him for another job as well as reccommend him to my friends and family!!! Thank you Carlos and his crew for such an awesome job!!!!! 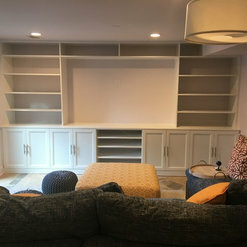 NJ Custom Closets is amazing!! Carlos was professional, quick, and went above our expectations! When he worked he was neat and cleaned up everything! 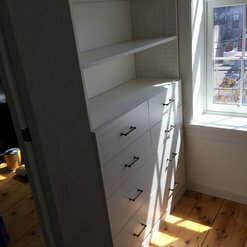 His work on our pantry was so amazing, we hired him to do our front hall closet and walk in bedroom closet as well! 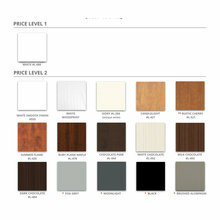 His prices blew others out of the water, there is no hesitation in my recommendation of NJ Custom Closets! Professional, knowledgeable and courteous. 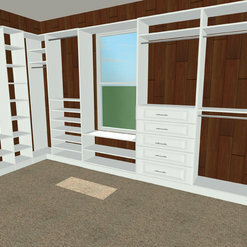 The closets were installed in a timely manner and the craftsmanship was excellent. This is the kind of pain-free and no-hassle service you dream of when you have work men come to your home. 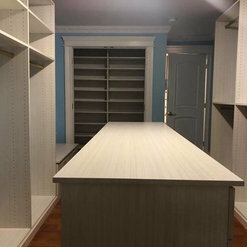 I will recommend NJ Custom Closets to my friends and family. Carlos and his father made my dreams come true with the ultimate closets. It is absolutely one my my favorite rooms in my house. They were so reasonable and their work ethic and quality were simply unbeatable!!!! I would recommend this company over and over. I’m still not done with them. I have more projects and looking forward to working with them in the future!!!!!!!!!! Carlos did an outstanding job with out projects. 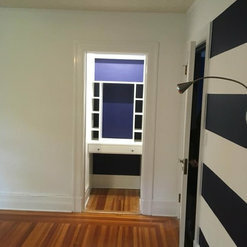 He customized a reach in closet, vanity and amazing window seat for us. He was very responsive and did fantastic work. Highly recommend. 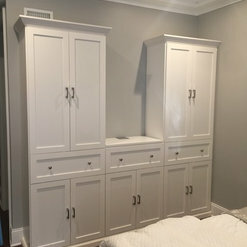 My husband and I are thrilled with the work that Carlos from NJ Custom Closets did for us. He designed beautiful closets that completely meet our needs now, and which give us flexibility to change them around later on if we need to. He came up with creative solutions for storing our clothes, did meticulous work, and was a pleasure to work with. 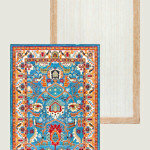 His prices were extremely readable and we are impressed at how high quality the materials are. 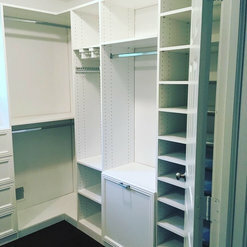 We are totally in love with our fantastic new closets. Carlos is extremely professional and hard working. 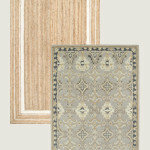 He made great suggestions about the closet designs and incorporated our family's needs in the designs. The installation and clean up went smoothly. 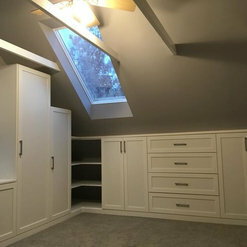 I highly recommend NJ Custom Closets for your custom closet needs. 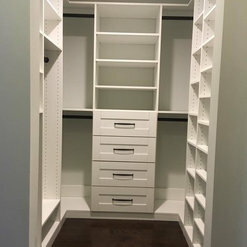 I am obsessed with my built in and closets!!! Carlos is so easy to work with. He is professional, reasonably priced and the work is perfection. He's responsive and flexible and made my visions come to life. I look forward to working with him again in the future. Highly recommend. 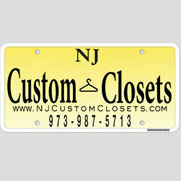 Carlos, is the owner, designer and Installer of the NJ Custom Closets. Wearing these various hats attributed to his being able to determine the best course of action and avoiding mistakes because he was involved in all aspects of the installation of the closets. 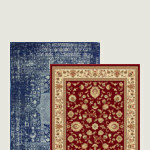 He is very professional, detailed oriented and tidy both during and after the completion of work. He was a pleasure to work with and I will not hesitate to use him again for any other closets that I may need in the future. I recommend him highly! Carlos installed 2 full walls of built ins and window seats in our Hoboken brownstone. He was professional and so easy to work with. 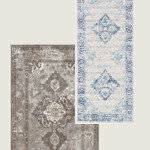 We met with a few companies and he offered the highest quality at the fairest price. We couldn’t be happier with the result as we have oodles of great-looking storage! We plan to build out our kids’ bedrooms next year .. 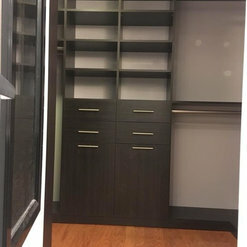 Contacted Carlos for a closet job, Within a day I was provided with several options to chose from via email.We agreed on a date for install the following week and 6 hours later, the project was completed flawlessly. Professional service, attention to details, excellent craftsmanship, would highly recommend Carlos's services to anyone. Carlos was professional and prompt from beginning to end. Carlos listened and was enthusiastic about my ideas and the project. Carlos and his dad did all the work themselves. 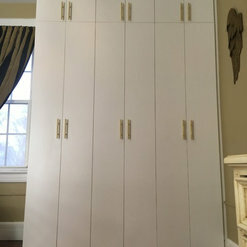 Carlos gave us exactly what we needed, the closets are beautiful and make the most efficient use of the small space available at a reasonable price! Thank you Carlos! Commented: what color is this?The color is called Ruby Planked Maple. Commented: How deep are the open shelves?Shelves are 14&quot; Deep. Commented: JanSorry for the super late Respond, These type of sliding doors Can Range Between $1.2k to $2k Depends on Material and other factors. 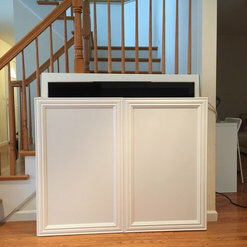 Commented: What can I do to improve this room?Adding a wall to wall ,floor to ceiling Entertainment center on that back wall can make it very Interesting.